I have been writing official organizational statements in response to religiously motivated acts of hate and violence for two decades. My heart sinks every time I have to do it, and, disgustingly, I have had plenty of opportunity to have gotten good at it. Why? They are needed so darn frequently, and they follow a rather prescribed pattern. Express grief and condolences, condemn the heinous acts, reflect on our responsibilities and faith callings, offer solidarity, and pledge commitments and a redoubling of efforts to address the troubling issues. Writing such statements is a necessary act, but it begins to feel empty. There is a sharp disconnect between the softness of the words and the indescribably cruel acts they seek to address. The alternative is arguably not acceptable, of course, because we cannot remain silent. Silence is complicity and resignation. It is just that statements are such a small act. And they are a reaction, when we all yearn for preventative actions and the all-around reduction of harm. Winning the cultural war of words and the ideas for which they are containers is a critical part of the formula for defeating hate in all its insidious forms. If you feel things are getting worse recently, you are right. The data unequivocally shows it in the US and in Europe. The long cry of “never again” is slipping its footing in the urgency of now. According to 2017 statistics from the Federal Bureau of Investigation, religiously motivated hate crimes are on a serious uptick since the start of the 2016 Presidential campaign cycle. Jews, their institutions, and their synagogues bear the harshest brunt, with nearly 60 percent of all hate crimes directed towards them. The Anti-Defamation League reports that in 2017 there was an almost 60 percent increase in reports of bias, discrimination, and acts of hate against Jews. Muslims are next and along with Jews combine for being recipients of nearly four of every five acts of religiously-motivated discrimination and hate in the United States. Data analysis from the Southern Poverty Law Center and other outlets shows that the perpetrators of domestic terrorism are much more likely than not to be White males and self-described Christians who are emotionally disaffected, mentally challenged, and affiliated with the ideologies of xenophobic hate groups. Even worse, these hatemongers are often highly armed with weapons typically seen only in the amphitheater of war. Research from the Center for American Progress and the Council on American Islamic Relations shows that the forces of hate are a well-funded machine through a network of foundations and donors, front groups, and self-described experts working in concert in ways that are largely hidden but thankfully traceable through certain “sunshine” mandates for information access in a free society. No other developed or developing nation approaches the US in gun ownership (e.g., Americans own nearly half the world’s guns) or the number of deaths per capita by gun violence (e.g., America is about 5 percent of the world’s population but accounts for 31 percent of global mass shooters). No other nation allows its citizens to have arms so unregulated. These facts make it painfully unsurprising that deadly acts of religiously motivated hate crimes like the recent Tree of Life Synagogue tragedy are on the rise and often have semi-automatic weapons of war at their center. Weapons like the AR-15 can easily shoot 30 rounds per minute (and arguably up to 100 when modified) are too often the culprit. The news media fixates on perceived threats of Muslims and migrants to the Southern border, but legal and illegal immigrants combined commit less crimes, including deadly crimes, per capita than their native-born counterparts. The real leading threats of impersonal mass violence in our society are the acts of violence by native-born White males who act as lone wolfs out of anger and delusion. Fear is natural and human. Emotions lead before reason, and, as a result, our fears are often misplaced, sometimes wildly, enabling a culture in which further damage can be advanced. Yet we can work to address fear within ourselves and within our neighbors, using patience, persistence, and thoughtful shared approaches. Lately, I have been thinking about the “words that make worlds” in connection to the coded dog-whistle language of anti-othering by hate groups and their followers. Unfortunately, the language of the 45th president of the United States has given an air of permission to it all. 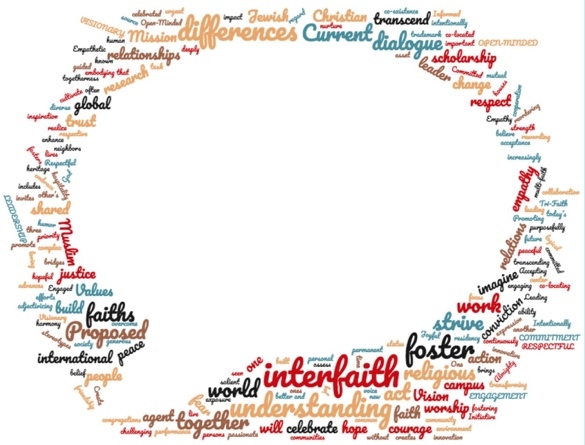 Our work has to start with addressing this language as intentional upstanders, a word that should readily be in our interfaith vocabulary and that signals the opposite of being a bystander. We have stomach-churning anti-Semitic, Islamophobic, anti-immigrant language in our midst that is blatant (e.g., the Muslim travel ban, false equivalence of “both sides,” inflation of a peaceful “caravan” into an “invasion,” repeated overtures to “really bad hombres,” and so on). It legitimates a negative ethos and unwelcome activities in response, if unchecked. The death of a young woman and chants of “Jews will not replace us” still echo from Charlottesville. But our deeper threats are the coded words more subtly in plain sight, such as using false caricatures of Jewish billionaire George Soros as a trope for the supposed wealth and cultural prowess of all Jews; such as a distortion of traditional frames for “religious freedom” to refer to a defense of the hegemony of Christians. They are a deeper threat because their presence is staggeringly voluminous, and those words have the power to make worlds – not just in secret hate groups or on 4chan, 8chan, and the dark web, but in the wide open. It doesn’t matter your faith… our respective scriptures and traditions inform us of our responsibilities regarding the care of one another. We are each called to honor the image of the divine that is inherent in every one of us, to hold the divine image up and see each person as being of unquestionable value and sacred worth. This includes the transforming reach of articulating and honoring the value and worth of those spreading hate. Our shared commitment towards building healthy and resilient communities and combating these acts of hate is something that takes the involvement of every individual in our communities. It involves each of us choosing to be an upstander and vigilantly identifying and addressing the smaller forms of bias, prejudice, and discrimination in our communities that can be precursors to such acts of violence. We have to confront them at every turn. We must remain committed to fostering and protecting a culture of respect and peace and inviting our neighbors to join with us in that commitment. The Anti-Defamation League frames the importance of being an upstander in our communities in terms of the “Pyramid of Hate.” The pyramid argues that the lesser, more subtle, and often ignored acts of bias and prejudice – which are often ignored out of an interest in maintaining a decorum of politeness – are the breeding ground for normalizing severe, more blatant, and startling acts of bias and prejudice that lead to more emboldened acts of discrimination and violence or worse. Nazi Germany did not rise overnight. It came in alarming waves of social norms erosion that led to an otherwise sane society allowing the legitimization of an unspeakable genocide. A frog who is placed in a pot of temperate water where the temperature increases slowly, degree by degree, does not jump out. The subtle changes are normalized until the frog meets his own death, never realizing what happened. Forces of hate want to separate, isolate, and disempower through fear and power. They want control of the state to dehumanize “the other.” The great strength of the movement for interfaith cooperation is its unwavering insistence on the value of diversity, in its championing of religious pluralism, in its not breaking ranks across lines of faith by surrendering to fake news and fears, and in its willingness to place intersectionality in solidarity with other movements that seek to overcome “othering” in its various stripes. Words do make worlds. Being an upstander means defending the type of world we want to see. Being an upstander means speaking out and up at the earliest signs of hate. Being an upstander means living out “never again.” Let us choose to honor with our words the world we are making, one that honors how out of many, we are one.